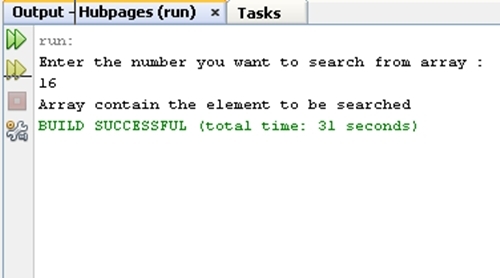 how to implement Binary Search in Java ?. System.out.println("Enter the number you want to "
System.out.println("Array contain the element to "
System.out.println("Array does not contain the element"
Video tutorial to demonstrate how to implement Binary Search in Java. How to use ArrayList in Java with example ?. How to Create User Defined Exceptions in Java ?. How to set path/classpath in Java ?. How to implement Stack collection in Java ?. How to run a simple Applet in Java ?. How Garbage Collection works in Java ?